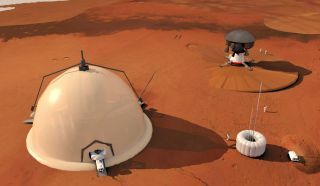 This artist's illustration depicts a novel Mars colony base concept by researchers at Switzerland's Federal Polytechnic School in Lausanne, which would use an igloo-like habitat near the Martian north pole as a home for astronauts. Mars explorers could live in an igloo-like structure near the Red Planet's frigid north pole, to take advantage of the seasonally abundant solar energy in that region, a new study suggests. The Martian poles are famous among scientists for their layered deposits of ice and dust, as well as for containing perchlorate. Perchlorate is commonly used as a rocket fuel here on Earth, and some microbes here actually tap the stuff for energy. The outpost would be covered by a dome made of polyethylene fiber shrouded in a 10-foot-thick (3 meters) layer of ice — sort of like an igloo. Underneath the dome would be a central core, which would include the living space, and three capsules that would serve as airlocks between that space and the exterior. Since the dome would overlie the core and capsules, it would protect Mars explorers against radiation and micrometeorite strikes, and keep internal atmospheric pressure constant as well. "The poles may pose more challenges in the beginning, but they are the best location for the long term since they harbor natural resources that we may be able to use," study lead author Anne-Marlene Rüede, a student minoring in space technology at EPFL's space engineering center, said in a statement from EFPL. "We wanted to develop a strategy based on technologies that have been selected accordingly and outline a test scenario so that, 20 years from now, astronauts will be able to carry out this kind of space mission," she added. The explorers would live off the land for at least nine months at a time, harvesting water, oxygen and nitrogen from the nearby ice. The carbon dioxide in the Martian atmosphere, as well as the silicon, iron, aluminum and sulfur in the soil, could be used to manufacture bricks, glass, plastic and fuels (such as hydrogen or methanol), the researchers said. Here's how the mission planning would go. First, robots would fly alone to the Martian north polar region to make a small living space for the crew, and to scout for locally available natural resources. The crew would come next. During the second mission, astronauts would use a sort of crane system that would orbit around Mars and move equipment from spacecraft down onto the planet's surface. Crane take off, artist view. "The crane vehicle could be reused several times and would be powered by fuel produced on Mars. It would reduce the payload that space shuttles would have to carry up to the research base," study co-author Claudio Leonardi, a scientist at EPFL, said in the same statement. "The vehicle's docking system would be similar to that used on the International Space Station: once a shuttle was docked, the vehicle would unload the cargo and crew and set them down on Mars." Crane landing with crew module, artist view. The researchers envision the base initially supporting a crew of six explorers. But putting the idea into effect could potentially lead to even bigger things down the road, study team members said. Crane on orbit, artist view. "We would need to conduct an initial mission to try everything out for the first time," Rüede said. "And the better that initial mission is thought out, the faster we will be able to get things going and move on to colonization." The study has been accepted for publication in the journal Acta Astronautica. It was also presented last week at the International Tourism Talks of the Future conference in Vixouze, France. Follow us @Spacedotcom, Facebook or Google+. Originally published on Space.com .